In his post-victory interview with ESPN's Norm Chad, Ciarin O'Leary preached patience, which he showed by folding his first 18 hands. But he waited for good hands, and doubled up a few times to get back into it, including a big comeback with pocket nines against pocket kings. O'Leary also mentioned that he was a big fan of fellow Irishman Dan Harrington, and repeatedly said that patience applies in the long run too -- he has played poker for a long time before reaching this, the pinnacle of his career. Hand #59 - Paul Evans has the button, he limps for 120,000, and O'Leary checks his option. The flop comes . O'Leary checks, Evans bets 500,000, O'Leary moves all in, and Evans immediately calls with for a pair of sixes. O'Leary shows , and leads with a pair of kings. Evans needs to catch a six, a three, or something runner-runner to stay alive. The turn card is the , and O'Leary hits trip kings while Evans picks up a flush draw. He needs a spade that doesn't pair the board to survive. The river card is the , and Paul Evans is eliminated in second place, earning $450,150. Ciarin O'Leary wins Event #3 ($1,500 No-Limit Hold'em), earning $727,012, a Corum watch, and a coveted WSOP bracelet. Hand #58 - Ciarin O'Leary has the button, he limps for 120,000, and Evans checks his option. The flop comes , Evans checks, O'Leary bets 200,000, and Evans folds. O'Leary takes the first heads-up pot. The players are back and ready to go, so it's time to shuffle up and deal! The blinds are still at 60,000-120,000, with a 15,000 ante, and there are about 11 minutes left in this level. Reminder: In heads-up play, the button has the small blind, and acts first before the flop. There will be a short break while ESPN sets up the final table for heads-up play. Hand #57 - Paul Evans has the button in seat 5, O'Leary limps from the small blind for 120,000, and Jacob checks his option. O'Leary checks in the dark as the flop comes . Jacob bets 150,000, O'Leary raises to 600,000, and Jacob thinks for over a minute before calling. The turn card is the . O'Leary moves all in, and then gets up to walk around the final table arena while Alex Jacob thinks things over. Jacob is in the tank for several long minutes, and O'Leary might be getting tired from all the pacing he's doing around the stage. Jacob eventually calls after a full five minutes with -- a pair of fours. O'Leary shows , and he's in the lead here. Jacob needs to catch a nine or a four to survive. The river card is the , and Alex Jacob is eliminated in third place, earning $282,367. The next player eliminated will receive $450,150, while the winner will take home $727,012. Hand #56 - Alex Jacob has the button in seat 3, he raises to 300,000, Evans reraises from the small blind to 1 million, O'Leary moves all in from the big blind, Jacob quickly folds, and Evans goes into the tank for several minutes before he folds. 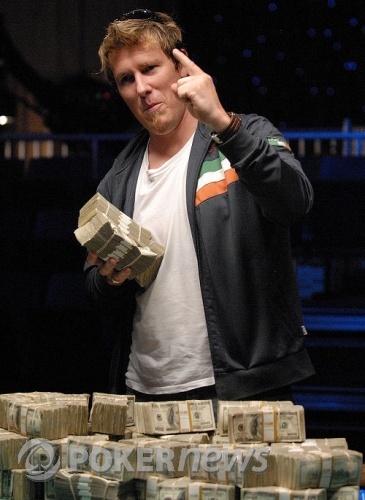 Ciarin O'Leary takes the pot worth 2.345 million.